By John MacArthur. 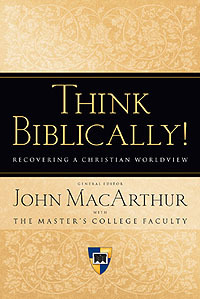 With the truth of the Bible as a foundation, MacArthur and Mayhue, with several other scholars and teachers from The Master's College, confront the false worldviews that dominate our postmodern world. The authors specifically provide a model from their chosen areas for cultivating a biblical mind-set on gender, worship, psychology, creation, education, history, government, economics, and literature.